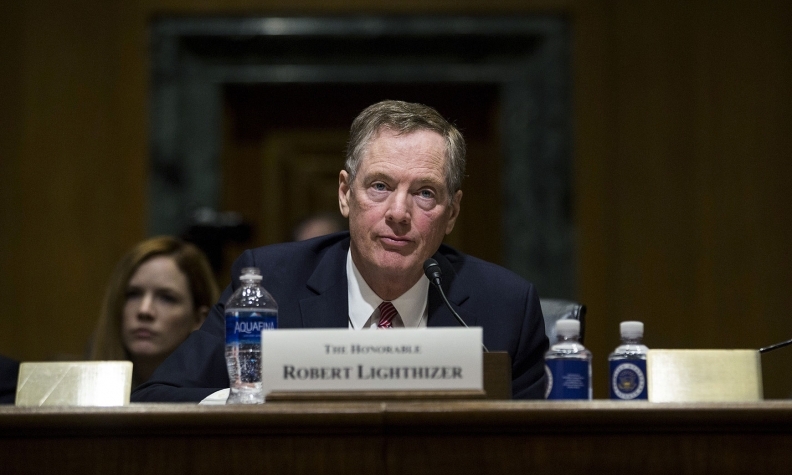 Robert Lighthizer told told a Senate committee in Washington on Wednesday that he wants to move as quickly as possible on NAFTA. United States Trade Representative Robert Lighthizer says he's not making any commitments to wrap up NAFTA's renegotiation within the tight timeline of year's end. Lighthizer told the Senate finance committee Wednesday that while he wants to move as quickly as possible, it's a much higher priority for him to seal a "very high-standard" agreement for the United States during the upcoming talks on the North American Free Trade Agreement. Lighthizer said his pursuit of quality over speed means he has set no deadline _ not even an artificial one. "There are people that have said we ought to try to get it done by the end of the year — that's a very, very quick time frame," Lighthizer said during his appearance in Washington, where he fielded questions about President Donald Trump's trade agenda. "We're certainly not going to have a bad agreement to save time…My hope is that we can get it done by the end of the year, but there are a lot of people who think that's completely unrealistic." The Mexican and U.S. governments have said they want NAFTA negotiations completed by the first quarter of 2018. If not, there are concerns the talks could be at risk of colliding with Mexico's presidential election. Andres Manuel Lopez Obrador, the current front-runner in the polls, is a populist, left-wing NAFTA critic. In his testimony, Lighthizer noted, without specifically naming Mexico, that the timing of its vote does indeed support the argument the three countries should move swiftly. "There are reasons related to other people's electoral systems that might make that beneficial, but from my point of view — I don't have any deadline," he said. "If we find ourselves in a total stalemate where we can't make any progress then we'll, in consultation with the (Senate finance) committee, decide on what next steps should be." Lighthizer said the Trump administration intends to move very quickly on launching NAFTA talks, which can begin as soon as Aug. 16, right after the conclusion of a 90-day consultation period in the United States. He noted the United States is still discussing the specific start date with its partners. He said next steps in the U.S. consultation process include public hearings scheduled for June 27-29 and the release of a detailed summary of NAFTA negotiating objectives on July 17. Canada's agriculture minister indicated Wednesday that Ottawa was waiting for the Americans to "set the table" for the NAFTA negotiations. Lawrence MacAulay was cautiously upbeat about the talks following his first meeting with the U.S. and Mexican counterparts. He said Canada would continue to defend its supply management system at the negotiating table, but offered no specifics. Nor would he divulge any details about how Canada would proceed on dealing with the key issue of agriculture during bargaining.